Designed to prevent dogs from getting entangled by their collars, the KeepSafe Break-Away Collar has a patented break-away safety buckle that releases when pressure is applied. If your dog's collar gets stuck on something and starts to choke, the buckle releases and the collar falls off harmlessly. Most collar accidents happen when multiple dogs are playing at home, at the dog park, or in doggie daycare or when the collar gets stuck on a fence, deck, crate, kennel, vent, bush, or tree. 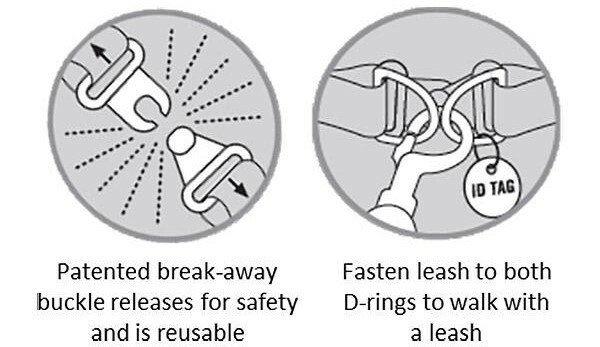 When you're ready for a walk, hook the leash clip around the 2 D-rings to prevent the buckle from breaking away. Collar-related accidents are more common than you think. A survey of veterinarians, trainers, and doggie daycare professionals found that more than 50% of pet professionals have experienced a collar-related accident with a dog. Over 26,000 collar-related accidents occur each year - that's an average of 71 a day! The KeepSafe Break-Away Collar is the only collar that provides 24/7 protection for your dog. To find the right size, measure your dog's neck and add an inch.